For a number of SEO, web design agencies and individuals, structuring and submitting a sitemap is most probably the initial step while taking on any website designing or SEO project. A lot of people will see an upsurge in traffic and commendable SEO results soon after they submit the sitemap to search engines. It also serves as a key method to enhance the client’s website performance. Let’s now go through this blog as it will give you an idea of what sitemap is, why it is important for your site, how to create XML sitemap and lastly how to submit it. These can be defined as the XML or HTML files that show all URLs on a site. This showing of URLs also includes the metadata for every URL including the information of its last update, how important it is on the website and do you update frequently or not. Sitemaps are extremely important when seen from SEO point of view and hold a key position on a website. They let search engines to crawl and index every page of it in a way that it appears in search engine results. HTML sitemaps also have their significance. They are more tilted towards human users as they help the website visitors to conveniently discover the content on the website that they are after. Google said that there are a few reasons that a client will benefit from a sitemap. · The website is quite new with fewer backlinks. · The website is way too large than normal. · The internal linking of the content isn’t done well, as a result of which the navigation is not so smooth. · The website might have a lot of rich-media content. Those tools that provide a visual representation are more useful for a web design or SEO agency. 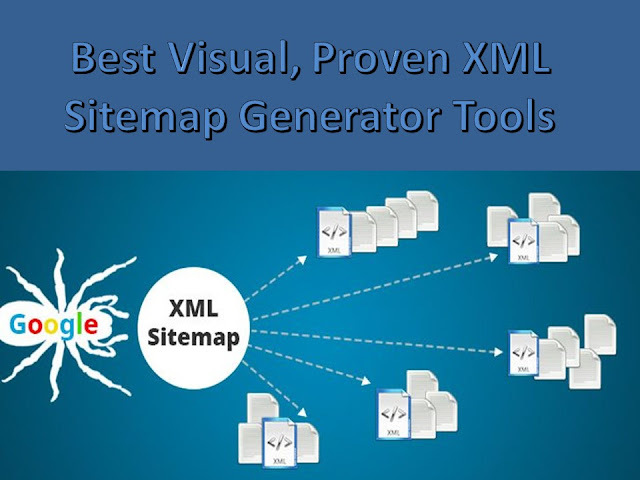 Also, these tools like XML sitemap generator and others are easy to use and also provide one-click usage options. While the usage of visual sitemap tool lets the clients truly grasp the main purpose of the sitemap and the reason for which the experts create XML sitemap. Below are some of the most reliable and most used visual sitemap tools. It is intuitive and easy to use visual tool that enables the SEO and design professionals to come up with attractive and trendy sitemaps extremely conveniently. The interface of Slickplan lets the user convenient drag and drop options with great customization of color and images. The final presentation using this tool is beautiful, scalable vector graphic or a simple text or XML file. Also, this easy to use tool lets easy sharing and collaboration amongst editors and a number of users. Due to its integration with Basecamp, it provides a WordPress plugin. Another tool for the development of interactive sitemaps that are way more than just URLs, here users can include comments, categories, analytics data and collaborate like never before. Dynomapper allows you to select from 3 sitemap styles named default, circle and tree respectively. These styles can then be customized with the logo and the color scheme. It also possesses drag and drop function accompanied by advanced crawler options and analytics integration. With the help of WriteMaps, you can create XML sitemap free for 3 times by making use of their convenient and intuitive visual sitemap planning tool. WriteMaps also provides a customization of colors, pleasing on the eye interface and also lets you to collect page content. Old sitemaps can also be archived with the passage of time as you start organizing and updating. The final product is a catching PDF or XML sitemap. This XML sitemap generator is kind of a mind mapping tool which can help to plan a project in a visual way. If you like to infuse a bit of creativity then Mindnode is the best website sitemap creator. Although you may not export the visual sitemap as an XML file but a PDF version of it can be used to impress the client. A simple text version is also handy. Mindnode can be used for Macs, iPhones and IPads. It can easily be downloaded from the Mac App store or purchased from iTunes.